How to create Control Arrays in VB .NET ? In VB6 there is a feature called Control Arrays, where you name controls the same name and provide them an index value. This allows you to set a value by looping through the controls and setting each value. One of the VB6 features that are no longer supported in VB.NET is the automated creation of control arrays by simply copying an existing control as many times as required into an array. The good news is that you can still set things up to do similar things. 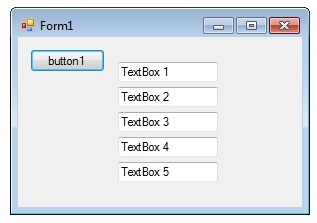 The following program shows how to create a dynamic TextBox control in VB.NET and setting the properties dynamically for each TextBox control. Drag a Button control in the form and copy and paste the following source code . Here each Button click the program create a new TextBox control dyanmically.